For the last two days, I was not feeling very well. I was having feverish feeling for the whole day. My body seems very warm but not warm enough to get a full fever. I also did not take any form of medication. As a result, I was feeling very uncomfortable and also chills at times. So I spent most of my time sleeping. By nightfall, I has some healing pain around my abdominal area and took a pain killer. Subsequently, I think the fever broke and I began to sweat. Of course, after that, I felt much better. Today, I want to share with you an enhanced therapy over Hyperthermia Therapy. Sometime back, I wrote about Hyperthermia Therapy and today, I want to build on that to introduce another therapy that is also based on heat therapy but an advancement over Hyperthermai Therapy. The latest and by far the best new weapon in the war on cancer is Oncothermia, more specifically called Oncotherm Loco-Regional Hyperthermia (OLRH). Not only does it successfully treat newly diagnosed cancers, it can deal successfully with stage IV cancers, and has been used successfully even when treating advanced cancers of the colon, lung, liver, pancreas and our all time favorite, glioblastoma (brain cancer). In Oncothermia a modulated electric field(based on Rife modulation) with a carrier frequency of 13.56 MHz is generated by two active electrodes with a diameter of 17 cm. Since malignant tissue has higher conductivity than healthy human tissue, the electric field tends to flow predominantly through the malignant tumor tissue. The combination of deep layer heating and the electric field leads to stimulation of malignant tumor cells. This, in turn, triggers increased apoptotic activity in the tumor region and as a result, promotes cell death. 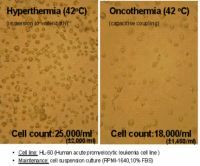 Compared with classic Hyperthermia, which can result in burns, Oncothermia works at a significantly lower temperature. 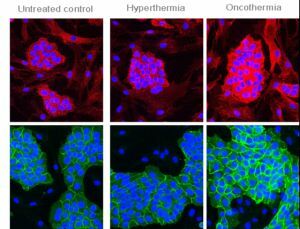 While classic Hyperthermia works at a temperature of 42°C, Oncothermia achieves a greater effect at just 38°C. Thanks to the selection at cellular level, the radiation only has an effect in the region of the tumor; the healthy regions remain as good as untouched. Oncothermia selectively heats the tumor tissue in the region to be treated. For this reason, Oncothermia is particularly indicated for the treatment of localized solid tumors. It does not matter whether the tumor is located on the surface or deep down. The principle of self-focusing also allows moving regions of the body to be treated, such as the lungs, or thermo-sensitive regions such as the brain. Oncothermia is effective both in areas with high blood flow, such as the liver, and in regions with high air circulation, such as the lungs. Microbiological tests have proven that higher ionic concentrations exist in the more active malignant cellular environment. Consequently, the extracellular matrix of malignant tissue inherently has greater conductivity and permittivity than healthy tissue. This difference facilitates selective focus on malignant cells even in highly mixed tissue containing large numbers of healthy and malignant cells. The derived advantage is the electric field tends to flow predominantly through the tumor tissue where the concentration of focused electric energy selectively heats the malignant cells to temperatures > 42°C. This process of natural selection is further enhanced by the electric-field modulation, which addresses the autonomous, non-collective behavior of individual malignant cells by reengaging the body's inherent immune response. Malignant tumor cells then die via a process known as "apoptosis". During treatment with the patient lies on the waterbed. 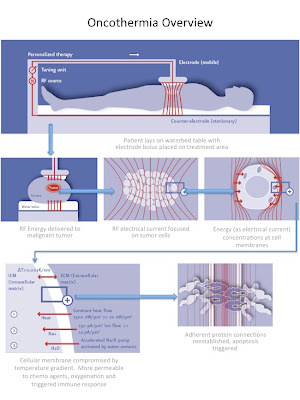 The electric field is set up between two electrodes: the bolus electrode positioned at the site where the patient is to be treated and the counter electrode positioned under the mattress of the waterbed. During the treatment, thanks to the interaction between the electric field and the heat, selection at cellular level takes place, the system self focuses on the tumor and apoptosis (programmed cell death) is increased. Usually, the patient is treated with 13,56 MHz radio frequency waves for 1-1½ hour every second day. 10 such treatments are recommended. Oncothermia can be used to treat a broad spectrum of solid tumors and has proven synergies with current standards of care. Oncothermia is safe, non-invasive, uses no x-rays, and demonstrates no side effects. It can be successfully integrated with other naturopathic protocols including IV Vitamin-C, IV Alpha Lipoic Acid, IV Mistletoe and Ukrain. Chemo-sensitization. OLRH sensitizes the tumor to complementarily applied chemotherapy because constrained thermodynamic flow effects destabilize the cell membrane, increasing its permeability and structural dysfunction, thereby increasing the absorption rate of the administered chemotherapy agent. OLRH compromises the tumor cell membrane allowing higher intracellular drug concentrations. The positive results of phase II/III trails have established that OLRH with chemotherapy is a novel clinical modality that allows the chemotherapy to be better targeted within the heated tumor. Radio-sensitization. OLRH sensitizes the tumor to complementarily applied radiotherapy by oxygenation (increased oxygen delivery to the cells via blood perfusion). The addition of OLRH during a series of radiotherapy treatments improves relevant clinical endpoints such as response rate, local control and overall survival. OLRH increases oxygenation, thus reducing hypoxia and amplifying the radiation cytotoxic effect. OLRH also inhibits the repair of radiation damaged tumor cells. Immune System Response. OLRH triggers antigen expression through the compromised malignant cellular membrane. Of particular significance is the release of heat shock proteins (HSP) that promotes a natural immune response destructive to the tumor. Danger signals such as mobility group B1 protein, ATP and HSP, which are released from treated necrotic tumor cells, stimulate the natural immune system and therefore assist the anti-tumor response. OLRH also stimulates the re-establishment of adherent connections (β-catenins, E-cadherins) that play a key role in triggering apoptosis and suppressing malignant cell dissemination. Gene Activation. OLRH activates the p53 tumor suppressor gene. Surgical Procedures. OLRH has application in the post-surgical setting to treat potential rogue cells liberated via biopsy or surgery. OLRH is clinically proven with over 100,000 treatments administered yearly at 180 facilities worldwide. For a list of clinics that are offering Oncothermia therapy worldwide, please click here. CT , thks for sharing, it is good information. Do I Know Where I am Going To?